Waking or sleeping, I dream of boats—usually rather small boats… If a man must be obsessed by something, I suppose a boat is as good as anything, perhaps a bit better than most. 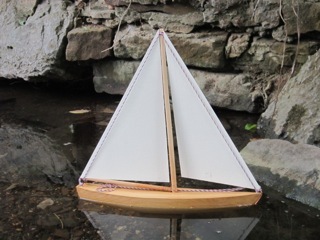 A small sailing craft is not only beautiful; like a fish or a bird or a girl, it is seductive and full of strange promise and the hint of trouble. I returned to the sea of necessity, because it would support a boat. I liked to sail alone. The sea was like a girl to me—I did not want anyone else along. Lacking instruction, I invented ways of getting things done, and so did not learn to sail properly, and still cannot sail well, although I have been at it all my life. I was always in trouble and always returned, seeking more trouble. I was twenty before I discovered that charts existed; all my navigation up to that time was done with the wariness of the early explorers.